The Dreamcast’s short but productive lifespan saw its most prolific period fall between 1999 and 2001, playing host to a slew of first-rate titles including SoulCalibur and Shenmue, as well as more obscure delights such as Treasure’s excellent Bangai-O. The flipside of this however is that the Dreamcast has its share of turkeys too, of which Sword Of The Berserk: Guts’ Rage is a bit of a prize-winner. It’s a game thoroughly devoid of merit. 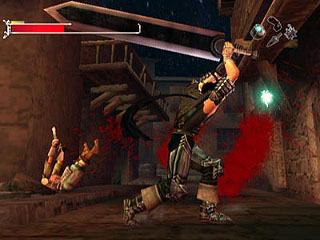 Originally released in Japan in 1999 before finally reaching European shores midway through 2001, Guts’ Rage is woefully dated and utterly bare-about-the-bones, both in terms of its gameplay mechanics and more crucially still, its failure to generate any sense of enjoyment. The story is a passable if rather generic tale based around the Berserk manga, seeing you assume control of mysterious one-eyed warrior Gattsu, who roams in search of a cure to a curse that threatens to engulf the land, causing people to become zombie-like. He also fights to save the life and mind of his beloved yet nevertheless entirely morose companion Casca. This sets the scene for one of the most incompetent hack ‘n’ slash adventures in recent memory. The snazzy, involved cut-scenes belie the fact that there is unbelievably little to Guts’ Rage, and what is present tends not to be very good. All of the potentially interesting scenarios take place in a bloated quotient of cut-scenes, leaving you with nothing more than a series of excessively tedious sword fights. Guts can’t talk to anyone; can’t interact with anything; can’t be upgraded, and can’t find new weaponry. All you can truly be sure of is that when the chatting is done, somebody or something new will have picked a fight with the angry protagonist, whether it’s zombies, beasts, knights or some form of savage shrubbery. Considering fighting is the only thing you do in the entire game, you’d be forgiven for thinking that developer Yuke’s would have at least made sure they got the foundation for combat properly in place. Sadly, it’s plagued with problems that lead to a lot of frustration. 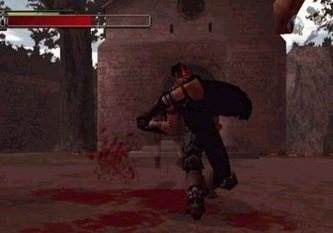 Though you’ll often find yourself surrounded by foes, cutting through them proves a laborious task; the lack of a lock-on feature (or remotely co-ordinated controls for that matter) means as often as not, Guts will carry on slicing away straight past an enemy, leaving him exposed to a pummelling from all sides. The combat controls are all over the place, and this becomes most apparent in the tougher situations, such as the boss battles. A couple of the bosses show a commendable degree of intelligence, with variable attack patterns making them tricky to read. However, using tactics seems increasingly pointless as the camera is unhelpful and Guts’ slide/dodge technique is as likely to land you in trouble as get you out of it, and simply hammering the attack buttons seems as effective a method as any concerted plan. Indeed, it seems that if you treat Guts’ Rage with more intelligence than it deserves, it only serves to make life more difficult. You can stick around to fight the hordes of enemies in each area if you choose, though it is rarely a requirement and hardly ever beneficial – it just increases the chance of you dying. Sure, running from fights is hardly the most enjoyable of pursuits, but it does at least provide some relief from the ill-conceived combat. Many environments featured within the game are cramped for space – chiefly streets, alleyways and underground passages. Predictably, this makes battling creatures with a massive sword problematical. Whenever Guts tries to strike an enemy near a wall, his sword ricochets off it, once again leaving him open to attack. You grow uncomfortably aware of your confines, and such settings seem unfathomable given how much they impair movement. 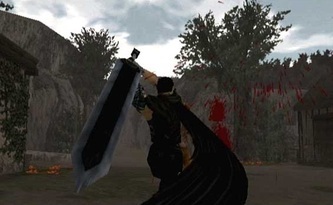 Guts has a limited number of moves at his disposal including close-range explosives and healing potions, whilst his ‘Rage’ move (activated after enough damage has been dealt) sees the screen go an ominous crimson and the lead protagonist go berserk, with twice the speed and power at his disposal. But it’s all a bit lightweight at the end of the day; these abilities would have seemed unremarkable on an early PSone game, let alone a Dreamcast. Next on the long list of problems is the chronic lack of longevity. Whilst there appears to be around an hour’s worth of cut-scenes, it’s debatable whether this is matched in terms of gameplay. Indeed, such emphasis is placed on lengthy cut-scenes, you get the impression Guts’ Rage is straying towards ‘interactive movie’ territory, except the movie in question isn’t any good, or especially interactive. 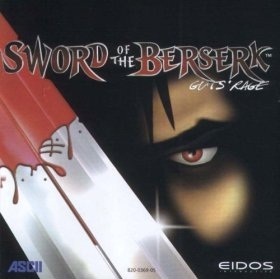 For some reason, Sword Of The Berserk doesn’t auto-save and instead requires that you quit after ‘reaching a new stage’, something that occurs just three times during the game, which means (barring total failure to progress) you’ll have a maximum of only four sittings before the credits start to roll. Softening the blow slightly is the inclusion of a ‘Prize Box’, which hosts some fairly standard content, including among other things, a gallery; a movie-viewer and a cute (if only very briefly diverting) mini-game starring Guts’ flying elf side-kick, Puck. Plus, if for some reason you enjoy the monotony, there’s always higher difficulty settings to tackle, though I wouldn’t advise you play it at all. Sword Of The Berserk’s good points are few and far between, though its best elements are chiefly catered for in its presentation. Neither the graphics nor the sound are world-beaters, but both are at least respectable. Though Guts himself looks slightly odd, the majority of the cast is smoothly animated with good facial expressions, and there’s a generally good standard of detail. There are some very pretty locales as well, it’s just a shame the best of them are seen only in cinematics. Music and voice-acting are similarly atmospheric and fit the bill nicely. In hindsight, it’s no great loss to the wider gaming world that Sword Of The Berserk: Guts’ Rage never saw life beyond its Dreamcast release. It’s extremely short, highly basic and offers little more than an hour’s worth of jabbing the ‘attack’ buttons. 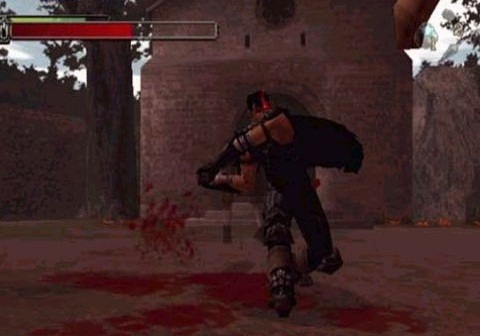 Around the turn of the millennium, games had started to evolve at great speed, and countless other superior titles of the time serve to highlight just how poorly Guts’ Rage utilised the Dreamcast hardware. Avoid. 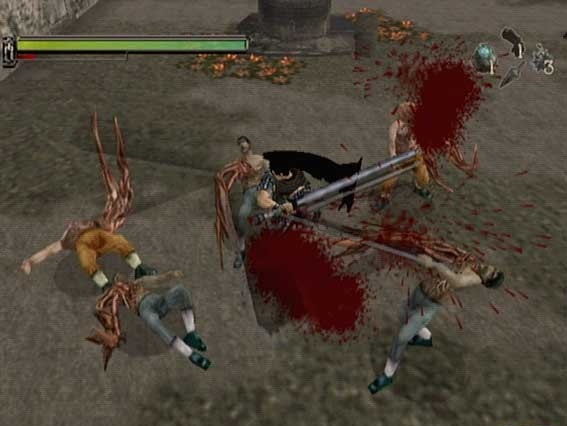 "it’s no great loss to the wider gaming world that Sword Of The Berserk never saw life beyond its Dreamcast release. It’s extremely short, highly basic and offers little more than an hour’s worth of jabbing the ‘attack’ buttons"